It’s easy to get stuck in a rut when it comes to breakfast. Like me, you probably pick what’s quick and easy for rushed mornings. Personally, I’ll get hooked on one item—like Cheerios—for months on end. But variety is the spice of life, not to mention good for your diet, so we’ve taste-tested three breakfast items that you can throw into your morning routine! I’ve known and loved Laughing Cow cheese wedges for awhile now. 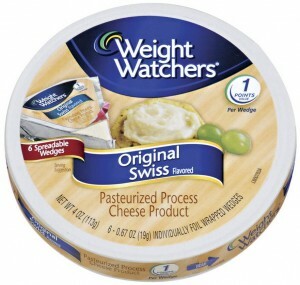 Now, Weight Watchers® has jumped on the cheese bandwagon—and we’re glad they did! Not only does the company have a new reduced-fat cream cheese, but it’s also got four varieties of cheese wedges: Parmesan Peppercorn, Original Swiss, Jalapeño Pepper, and Garlic & Herb. I found the reduced-fat cream cheese to be easily spreadable though unremarkable—there’s just not much to say about cream cheese—but the wedges were more fun to try. My two faves by far were Original Swiss and Garlic & Herb. Both were mild and would be yummy spread on bagels, crackers or perhaps an English muffin. If you’re looking for a bit of a kick, try Parmesan Peppercorn or the Jalapeño Pepper. The pepper was a little overpowering to me, and the jalapeño version would probably not be the best breakfast option, but if you’re looking for more spice in your cheese, those are the best picks. Plus, clocking in at 30 calories, 2 grams of protein and 1 gram of fiber, this cheese won’t break the caloric bank. Like Jared, I can always count on Subway for a healthy meal on the go. Sure, it’s not gourmet, but it’s an easy spot to get a filling lunch, hold the grease. Curious as to how the new breakfast items would stack up, I headed into my usual Subway on a Saturday morning to give them a shot, hubby in tow. Unfortunately, while our stomachs were growling, they were not exactly prepared, despite advertising for breakfast outside and being open early. They didn’t have any eggs, which is basically the heart of any breakfast sandwich. This Subway has been out of items I’ve wanted on multiple occasions, so this experience led us to find a new Subway, which was actually closer to our house and was more than ready to serve breakfast. Bright side! Like the subs, you can easily customize the breakfast offerings to fit your tastes, whether it’s with an English muffin, sub or flatbread. I opted for Egg White and Cheese on an English muffin, with green pepper and onion, while my hubby tried the Steak, Egg and Cheese on an English muffin with the veggies. Once pulled out of the oven, both were piping hot, filling, and tasty. The hash brown we split tasted good even though it was a little mushy. Unlike at McD’s, it was nice to be able to throw veggies at your breakfast, although the lack of a drive-thru option makes this a slightly more time-consuming breakfast option. If you’re going to Eat Fresh for breakfast, keep a couple of things in mind. 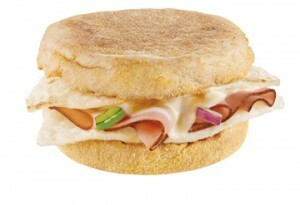 All of the English muffin options except for the Double Bacon, Egg and Cheese, clock in at less than 200 calories. My Egg White and Cheese logged 140 cals and 3.5 grams of fat with 5 grams of fiber. Steak, Egg and Cheese was 190 calories with 7 grams of fat and 6 grams of fiber. But beware: When you make the meals into a sandwich, you add quite a few calories. The calorie counts on the sandwiches range from 320 for the Egg White and Cheese to 520 for a Double Bacon, Egg and Cheese sandwich. So choose wisely and enjoy those veggies for breakfast! Although maybe not your typical breakfast item, I’ve been grabbing almonds lately as an easy, protein-packed addition to my morning meal. My affair with almonds started after trying the Blue Diamond Oven Roasted Sea Salt Almonds at a preview event for Self magazine’s Workout in the Park. 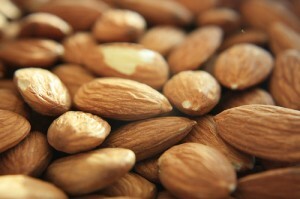 Since then, I’ve been munching on a few almonds here and there, as they’re a great way to get good fats and stave off hunger until the next meal. Plus, they’re a crunch-tastic way to get a few grams of fiber. Want to try some WW cheese or Subway breakfast items? Comment below for a chance to win the morning yummies. We’ll email winners in about a week, so check your email! U.S. residents only, please. Disclosure: The Weight Watchers and Subway items were provided for review by their respective manufacturer, but in no way is this post or our review of products sponsored, influenced or paid for by any company. We tell it like it is!